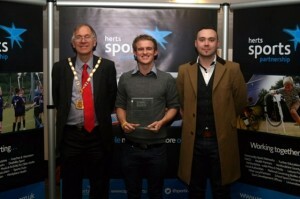 On Tuesday 9th December at the Herts Service to Sport Awards 2014 which was held at the Weston Auditorium at the University of Hertfordshire. 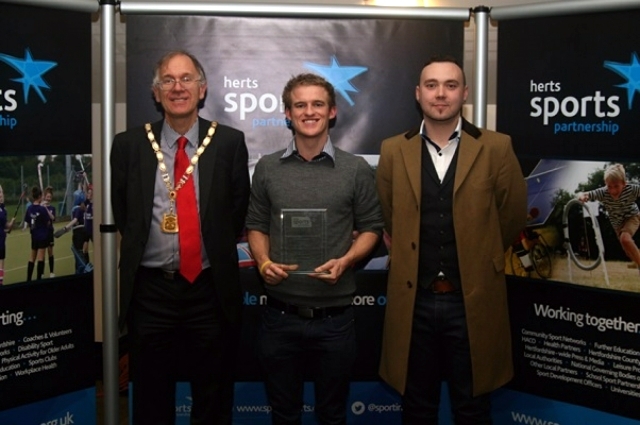 Masters Coach Stuart Clarke was voted Male Sporting Coach of the Year 2014 out of 14 nominees from all sports across the County. 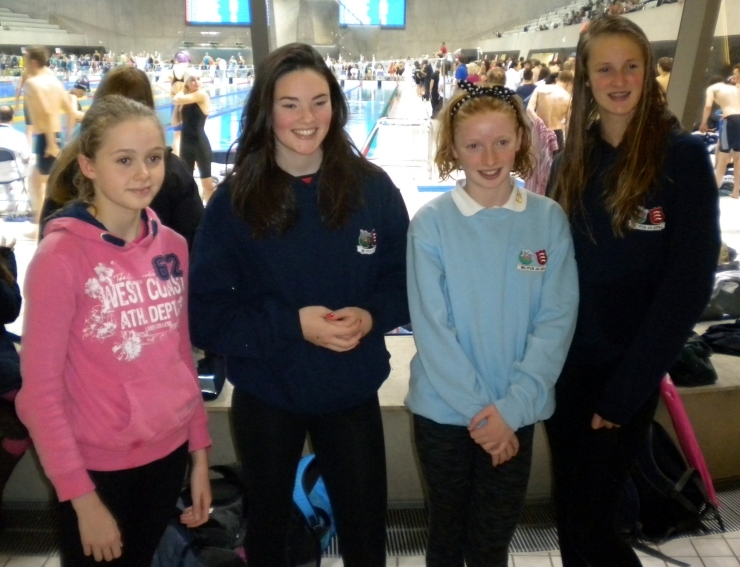 On Saturday the 22nd of November eight swimmers from the Bishops Stortford Swimming Club travelled to the London Aquatic Centre to represent their schools in the 57th National final of the Secondary School Team Championships. 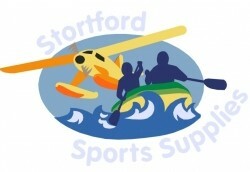 Harvey Bannister, Daniel Chada, Callum Davis and Steven Raphy were representing the Bishops Stortford High School and qualified for both events in the Intermediate Boys’ category, the 200m Medley and the 200m Freestyle Relays. Sarah Carroll, Anya Fletcher, Eleanor Mason and Josie Pretious-White representing the Hertfordshire and Essex High School and Science College, qualified for the Junior Girls 200m Medley Relay. The first event for the boys was the 200m Medley Relay. Dan got the team off to a great start with an impressive 31.77s in the backstroke leg, Harvey then took over to swim a strong breaststroke leg in 36.49s. Callum was up next powering through the butterfly and touching in 28.37s and Steven completed the freestyle for the team with a determined swim of 30.69s touching in 2.07.32 to bring the team home in 15th place overall. The second event for the boys was the 200m Freestyle Relay at the end of the day. All the boys gave gutsy performances Steven (31.40s), Harvey (29.30s), Daniel (29.50s) and Callum (27.20s). The team finished with a time of 1.57.50 finishing 20th overall. Anya started for the girls in the 200m Medley Relay with a great performance recording 37.22s in the backstroke, Sarah then followed with a strong swim in the breaststroke leg 40.92s. The butterfly was swum by Josie in an impressive 31.66s. Eleanor swam a very convincing 34.90s in the freestyle to take the team home in a time of 2.24.70, finishing 16th overall. For both teams it was their first competition in the prestigious 50m Olympic pool. Both teams performed brilliantly competing against the top school teams in England. They all rose to the occasion with all swimmers securing personal best times in their swims. 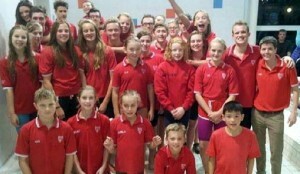 On Saturday 8th November 2014, a team of 37 swimmers from Bishop’s Stortford Swimming Club competed in the second round of the National Arena League held at Hertfordshire Sports Village in Hatfield. As in Round 1, they again faced top-flight opposition, competing against some of the UK’s best amateur swimmers. The opponents drawn were Hatfield, Enfield, Teddington, Watford, Wandsworth, Chelsea & Westminster and City of St Albans.